BROOMALL, Pennsylvania (September 6, 2017) – For their exceptional leadership, ingenuity and positive impact on the region, Partner’s Consulting, along with seven other companies and two individuals, has been selected by The Chamber of Commerce for Greater Philadelphia as winners of the 35th Annual Excellence Awards. The Excellence Awards, which will be presented at the Chamber’s dinner on Nov. 9 from 5:30 to 9 p.m. at the Sugar House Casino in Philadelphia, celebrating companies that are making a positive impact in the tri-state region. This year’s winners join the ranks of notable past Excellence Award Honorees. Past Excellence Award winners have gone on to grow their businesses into the most successful companies in the area. 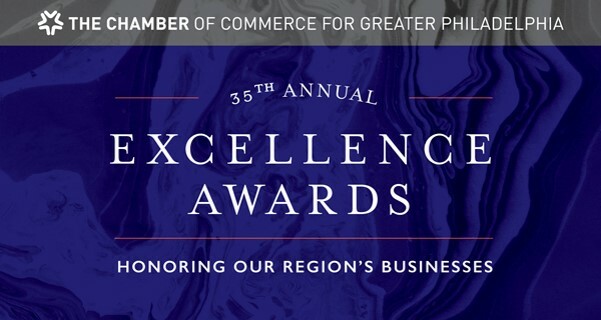 For more information on the 35th Annual Excellence Awards, visit: ChamberPHL.com/EA. Partner’s Consulting is an Information Technology consulting company with over 11 years of experience in providing professional services to our clients focusing primarily in Technology Project and Product Delivery. Our consultants successfully deliver large-scale technical implementations and technical project support for Fortune 500 and 1000 companies. With hard work, we’ve built our reputation as a market leader who consistently provides high quality consultants and highly personalized service. Our name refers to our commitment to partnering for mutual success. As partners, our team works thoughtfully and carefully side-by-side with our clients and consultants to ensure a productive and rewarding match. As a certified woman-owned business, we recognize the enormous value that a diverse work team brings. It’s in this spirit that our team has proudly taken the lead to support and encourage women and minorities in gaining the confidence to break into the IT space, further their careers and ultimately increase their presence in the IT industry. Our entrepreneurial, agile and innovative approach enables us to provide quality and excellence quickly. Our key focus is on delivering technology resources with values, relationships and trust. We apply an executive search style to our recruiting method, making us stand above our competition and creating a unique and lasting culture. Founded in 2006 by Peggy Gionta, Partner’s Consulting has been recognized for its remarkable growth by multiple publications, including the Inc. 5000, Philadelphia 100, Philadelphia Business Journal and Philadelphia SmartCEO, and was named the 2016 Medium Business of the Year by the Main Line Chamber of Commerce.